Jerusalem, Dead Sea, Galilee, Tel Aviv, and more! 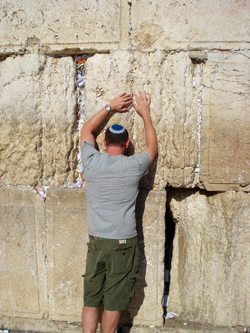 Israel is one of those places many have been wanting to visit for years, but just never found the right time. 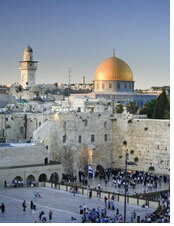 This November, Zoom Vacations has developed a tour to Israel that will make you glad you waited until now! 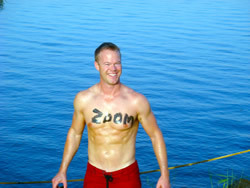 Zoom Vacations trip to Israel explores the history, culture, cuisine, and gay nightlife with sensational guides, while enjoying the finest hotels in Jerusalem, Galilee, and Tel Aviv. • Meet & greet service inside the airport upon arrival & departure, available upon request, to make your arrival as carefree as possible. • Professional English speaking guides throughout the trip. • Gay nightlife excursions in Jerusalem and Tel Aviv. 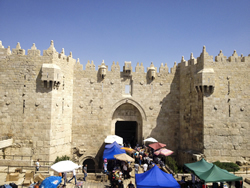 • Jerusalem city tour including a visit to the famous city walls, Rabbinical Tunnel, Via Dolorosa (Way of the Cross), Church of the Holy Sepulchre, marketplace, and more. • Visit the fortress of Massada, the last stronghold in the zealots battle against the Roman Empire. • Optional swim in the world famous rejuvenating waters of the Dead Sea. • Ground transfer in air conditioned vehicle from Jerusalem to Tel Aviv. • Portages at airports and hotels. Jerusalem, Galilee, and Tel Aviv Gay Pride, and more! Welcome Dinner at one of Jerusalem's best restaurants. After breakfast visit the Israel Museum to see the Model of Jerusalem as it was 2000 years ago, as well as the Shrine of the Book where the Dead Sea Scrolls are housed. 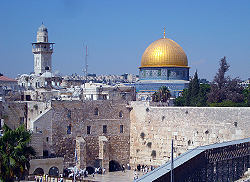 Then we visit the Temple Area of the Old City of Jerusalem. 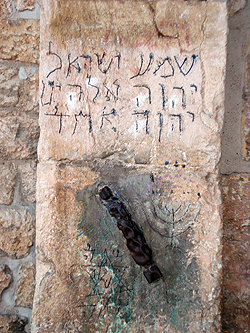 At the Western Wall - the Kotel, you will see prayers and rituals of intense worship. Continue towards the Southern Wall excavations to see the Davidson Center and its superb 3D exhibit, which illustrates how life revolved around the Temple in ancient times. 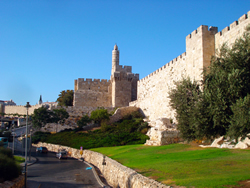 We will also see the Old City from the Mount of Olives. At the foot of the hill is Gethsemane, the olive grove where Jesus spent his last night and was betrayed by Judas. 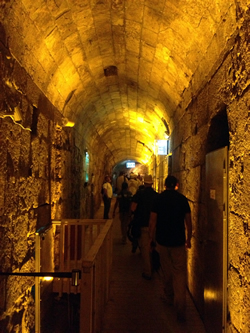 Then enter the walled old city via Zion Gate and proceed to the Jewish Quarter. 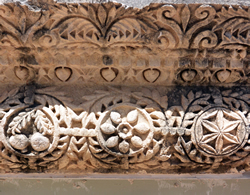 At the Cardo see the ancient Roman road at the heart of the city and visit the restored Sephardic synagogues. View the unearthed main Roman thoroughfare and ancient marketplace lined with columns. 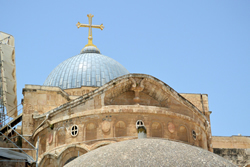 Walk through the Arab Bazaar and along the Way of the Cross to the Church of the Holy Sepulcher where you see Pilgrims from across the World venerating the Tomb of Christ. After breakfast start the day with a dramatic view of Jerusalem from the Mt Of Olives and Gethsemane below. Then we depart overland down the Jordan Valley and the moonscape of the Judean Desert and down to the Dead Sea (the lowest point on Earth) to Masada, where you continue by cable-car up to the last stronghold of the Zealots. Some 2000 years ago, Roman legions stormed one of the two paths to the top of this sandstone mountain to reach the Jewish Zealots headquartered there. The brave Israelite soldiers held out for three years against the invading Roman army before taking their own lives to avoid capture and enslavement. 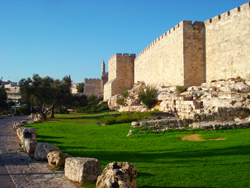 Many of their fortifications, originally built by King Herod, still stand. After visiting Masada, drive to Ein Bokek where you have lunch and the opportunity to use the hotel pool and swim in the Dead Sea. Return to Jerusalem in the late afternoon. 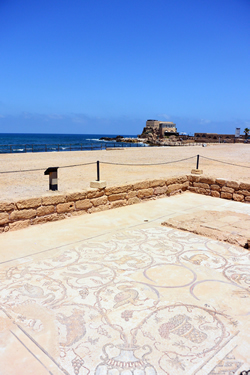 We will begin our tour today with a visit to Caesarea, where you see the contrast from "new" to "old". This 2000 year old city - built to honor Augustus Caesar - was once the capital of the Roman province and was later occupied by the Crusaders. After Caesarea, we will visit a picturesque artists' village, the only one of its kind in Israel and one of the few such villages in the world. Nestled in natural vegetation and bordered by an ancient olive grove, it lies on the western slopes of Mt Carmel, in a breathtaking landscape looking out toward the sea and the Crusader fortress of Atlit. Here will we see artists at work and be surrounded by one of the largest collections of Israeli art. 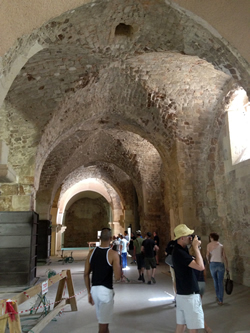 Then on to Acre, one of the world's oldest seaports, mentioned as far back as 3,500 years by the Pharaoh Tuthmosis III and now designated an UNESCO World Heritage Site. Phoenicians, Romans, Arabs, and a succession of Crusaders occupied the town but Napoleon famously failed to conquer it. 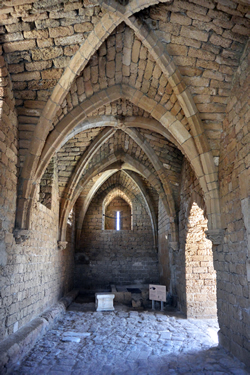 Acre was the main base for the Crusades and today you can see the stunning Halls and buildings of the Knights Hospitaller and Knights Templars. We will arrive at our luxurious hotel, which offers a serene landscape with beautiful views of the surrounding mountains. at leisure to enjoy the nearby countryside, explore more of the region, or simply relax by the pool. After breakfast we will explore the nearby Golan Heights region, which is historically and strategically very important to Israel. We will notice the start contrast of geography versus the desert, as the increased altitude allows for much milder temperatures and greener areas. Many types of grapes grow well in this climate, and we will explore (and taste) the offerings of the thriving Israeli wine industry, which has been expanding greatly over the years. Upon arrival in Tel Aviv, we will see the differences between the ancient area of Tel Aviv, Old Jaffa, and the modern architecture of what is possibly the most progressive city in the Middle-East. Jaffa is argued to be the oldest seaport in the world. From the Bible, It is also where Jonah was swallowed by a whale, so be careful when swimming. Nowadays it is one of the most diverse and heterogenous parts of the city of Tel Aviv and has a thriving arts scene. Check in to the Tel Aviv Hilton, located in the heart of all the Gay Pride events, as well as right in front of the gay beach. 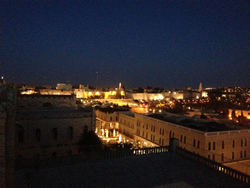 Introduction to Tel Aviv and Old Jaffa. We will see the differences between the ancient area of Tel Aviv, Old Jaffa, and the modern architecture of what is possibly the most progressive city in the Middle-East. Jaffa is argued to be the oldest seaport in the world. From the Bible, it is also where Jonah was swallowed by a whale, so be careful when swimming. 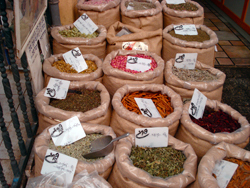 Nowadays it is one of the most diverse and heterogenous parts of the city of Tel Aviv and has a thriving arts scene. At leisure to explore the incredible city of Tel Aviv. 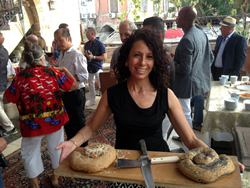 Day at Leisure for exploring Tel Aviv and for optional excursions. 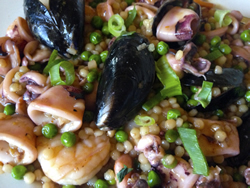 Enjoy a special dinner at one of the best restaurants in Tel Aviv. An intimate and elegant sanctuary, and the hotel of choice for discerning visitors to the eternal city of Jerusalem. Located in the heart of the city alongside Jerusalem's new shopping and entertainment experience the Alrov Mamilla Avenue, with its magnificent views of the Old City walls, the Tower of David and Jaffa Gate, the Mamilla Hotel is the very heart of Jerusalem's rich cultural heritage and bustling day life and is a leading luxury hotel in Jerusalem. Designed in collaboration with Alrov Luxury Hotels vision and commitment to excellence and execution and in partnership with world-renowned architects Moshe Safdie and Piero Lissoni, the Mamilla Hotel incorporates contemporary comforts and distinctive furnishings to create a unique ambience that both stimulates the senses and relaxes your body and soul. Featuring exceptional rooms, distinctive restaurant and bar venues, and incomparable service. 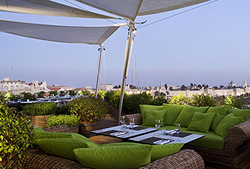 From the magnificent views of the Rooftop outdoor lounge & restaurant, through the shimmering ambience of the Mirror Bar, to the immersion of the Holistic Wellbeing Retreat, Mamilla Hotel in Jerusalem is ushering in a new era of luxury lifestyle hospitality. High above the enchanting hills of upper Galilee is a place in Israel like no other. This Mediterranean-style chateau is Northern Israel's most beloved estate, located within a national forest and wildlife reserve. Each of its 26 suites has breathtaking views of the forest surrounding it, as well as of Lake Kineret and the Golan mountain range. 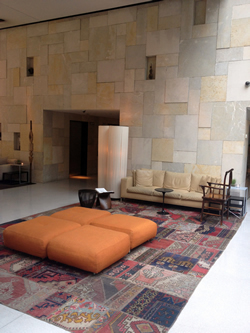 Its thoroughly modern and chic interior design contrasts perfectly with its traditional stone structure. The perfect place to relax and enjoy the pool and desert spa after exploring the historic surrounds of Galilee. Bayit Bagalil has a full-service spa. Dining options at this luxury hotel include a restaurant, a poolside bar, and a bar/lounge. Additional amenities include gift shops/newsstands, a garden, and a picnic area. Rooms have garden views. Amenities in air-conditioned guestrooms at Bayit Bagalil include CD players and bathrobes. Complimentary wireless high-speed Internet access is provided. 32-inch LCD televisions are equipped with cable channels and DVD players. All accommodations provide desks and phones with voice mail; free international calls are offered (restrictions may apply). Bathrooms offer bidets, makeup/shaving mirrors, hair dryers, and slippers. Additional amenities include ceiling fans and windows that open. In addition, amenities available on request include extra towels/bedding and wake-up calls. Housekeeping is offered daily. Perched on a cliff overlooking the Mediterranean Sea, the Hilton Tel Aviv hotel is just one minute from the beach and only a short stroll from Tel Aviv's shopping centers, restaurants, and cultural landmarks. Lounge by the large saltwater pool and savor alfresco treats from the Pool Bar. De-stress and relax with a soothing massage or aromatherapy treatment with natural herbal products at the Hilton Tel Aviv hotel. Work out with cardiovascular machines and weights in the fully equipped fitness room. Unwind in the sauna after your exercise session. Dine in one of five sublime Kosher restaurants and bars. Sample fine sashimi in the Yakimono Sushi Bar, or indulge in sophisticated Mediterranean dining at King Solomon Restaurant. Enjoy your stay in this 32m²/344sq.ft room with a sea view, balcony, working area and marble bathroom. The bright and airy room, has large opening windows. All rooms, from Hilton Guest Rooms to Suites, have wireless internet access and private balconies. Most have sea views. The minimalist blue and beige decor is designed to highlight the beautiful landscape and inspiring Mediterranean views. Chestnut wood furniture, granite tables, and linen upholstery complement the elegant design. These impeccable hotels were chosen for their location, style, comfort, and service. 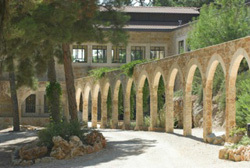 We hope they provid the perfect home away from home while you are touring and exploring Israel.